Our specialty is accommodating your individual needs. Please call and let us know how we may craft one of our Personalized Leather Photo Albums, Leather Guest Books, Personalized Leather Wedding Guest Books, Professional Photo Portfolios, Leather Presentation Portfolios, Leather Letter Pad Portfolios, Leather Journals, Leather Photo Envelopes, or Leather Wine Totes to satisfy your purpose. in a Powell handmade leather photo album. Our handmade leather photo albums and portfolios are in a class of their own. Available in 12 x 12, 8 x 10, 8 x 8, and 2 up 4 x 6 sizes, these albums will handsomely preserve your photographic memories for generations to come. 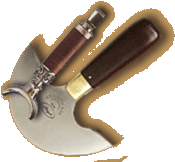 are the right choice for any occasion. Our handmade leather guest registers are built to offer years and years of faithful service. They are by far the best choice for those who want the best. Your book may be personalized down to the page layout. Photo pages may also be included in our large guest books, allowing you to not only record the names and comments of those present at your important events, but visual memories as well. Personalized wedding guest books are also available. to meet your personal or business needs. Are you looking for a handmade leather guest book for a special purpose or event? Just let us know what information you would like to collect from your guests , if you would like an image or company logo to appear behind the lines, and we will be happy to create a guest book page layout specifically for your purpose. 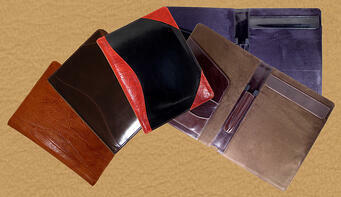 you go in an elegant, yet practical leather photo envelope. Our handmade photo envelopes are a great accessory for carrying wedding, new baby, or family photographs with you wherever you go. They also make excellent purse organizers! 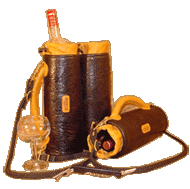 PortAmore’ is the ultimate handmade leather wine tote! These beautiful totes are available in both double, and single tube designs in your choice of colors. A trap door safely separates the glasses from one another in the lower tube, and a corkscrew pocket is stitched within the upper tube. Glasses and corkscrew are included. 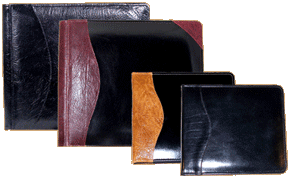 Powell Leather Letter Pad Portfolio. 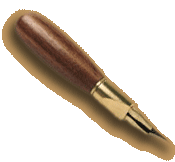 Our leather letter pad portfolios will offer you years of service with a simple and practical design. At meetings, or on the job, our padfolios will always be a classic companion. 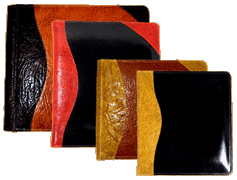 Would you like an image, family name, or your company logo to appear on the cover leather? We will be happy to create a personalized photo album, portfolio, journal, or guest book to satisfy your purpose. Learn more about custom and personalized leather photo albums and guest books. Learn more about designing your own personalized guest book page for your custom guest book. Let us help you design your personalized wedding guest book, or wedding photo guest book. I LOVE LOVE LOVE the Albums!!! They are way better than I expected and well worth the wait!!! Obviously I found them at the old house no problem! Just so excited about them! I can't wait to give you more business. My sister is getting married in May, do you have any wedding samples? This turned out incredible!!!! Thanks so much! My daughter loves it! If I ever need anything else or if I hear of someone that needs something done, they will be sent your way also!! Great job!!! !